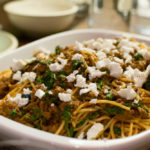 Moroccan pasta is one of my favorite meals. 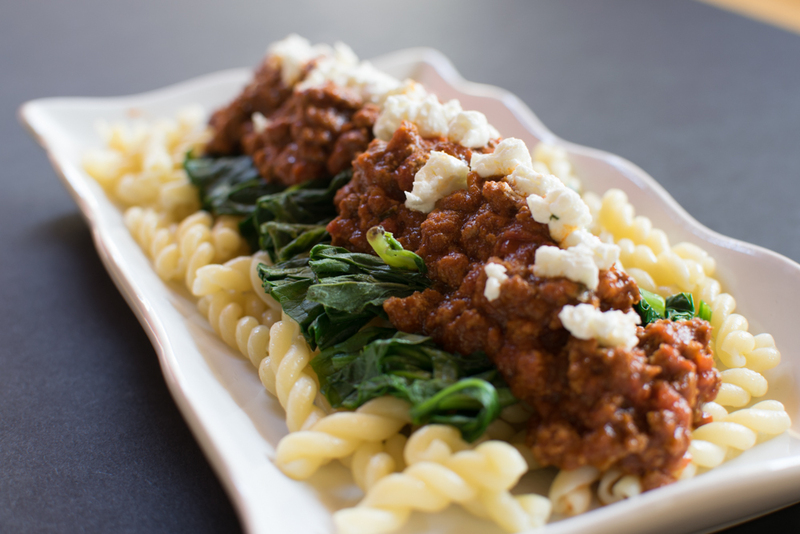 The spicy meat sauce with a hint of cinnamon with creamy goat cheese is just so delicious! Usually we mix the spinach into the sauce and let it wilt, but this time I served it on a bed of the spinach and I think I like it better! I hope you give it a try. Wow, the video we made is really old – I’m so young! I think we will have to post an updated video! I also made it on Q13 FOX News 2 years ago. 2 words: Love it!!!!!!! My friend and I made this together and we had so much fun! It was soooooooo delicious! Also, when are you going to make another video? I love your videos! 2 words: LOVE IT!!! My friend and I made this together and we had so much fun! It’s soooooo delicious! Also, when are you going to make another video? I love your videos! Thank you for writing back! I hope time to enjoy more of your recipes. Btw, your sister is the best taste tester ever!!! Also, I love how you are so happy in every video! I makes my day so amazing and makes eating heathy so fun! Sorry! I meant I hope I have time to enjoy more of your recipes. There was a typo.